Samsung has just unveiled its radically fresh Galaxy S6 edge, which not only sports premium materials in its build, but also has its screen curved on both ends for a unique, bezel-less look. Having some hands-on time with the device, we had the opportunity to compare it side by side with the LG G3 – the first smartphone to bring QHD displays to the worldwide market, and a pretty potent, well-liked handset overall. Let's see what's up! The LG G3 employs a plastic body, which is none the less finished in a very cool, faux-metal paint, which looks cool and keeps the phone both pleasant to the eye, and easy to hold. The G3's impressive screen-to-body ratio of 75.22% allows for a large 5.5” screen to adorn a relatively compact body – something that is still rare to see on most handsets. The G3 also has its hardware buttons on the back of the device, just below the camera, right where the user's index finger is most probable to be rested in normal handling situations – a cool signature touch that LG has been adding to its handsets. 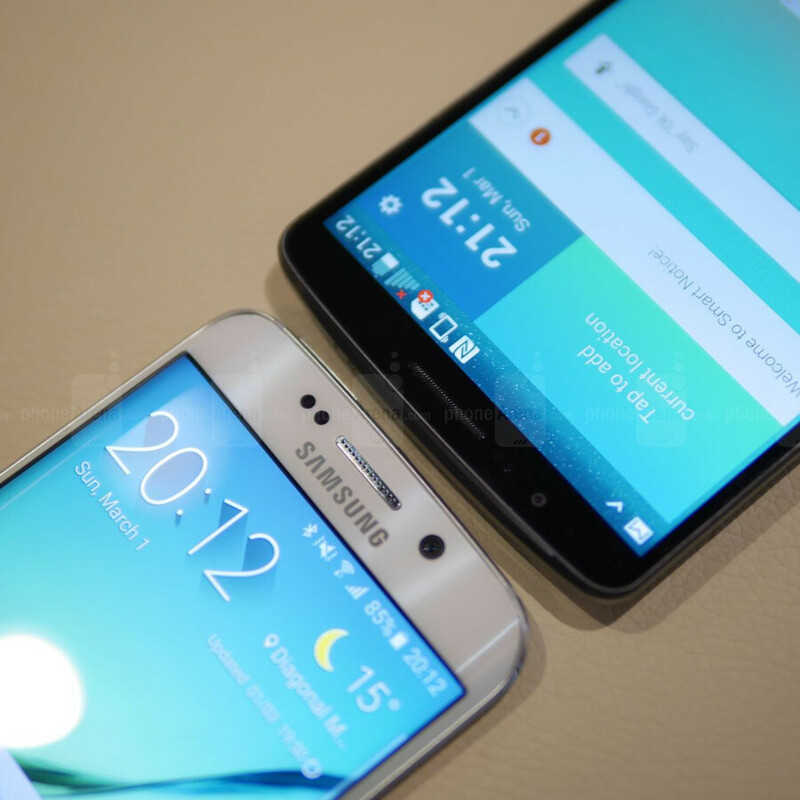 The Galaxy S6 edge is quite the step up in terms of the Galaxy S line design language so far. No more plastic flagships – the new handset sports a metal rim, while its back and front are covered in Gorilla Glass 4. The design is very classy and the handset is worth gawking at, while still being pleasant to the touch. Its hardware buttons are placed on the sides of the frame – power button on the right, volume buttons on the left – are easy to reach, and flow well with the phone's design. Both handsets sport super pixel-dense QHD screens, which means their resolution is 1440 x 2560 pixels. The G3's screen measures 5.5” across its diagonal, which lands its PPI ratio at 538, whereas the Galaxy S6 edge's 5.1” screen holds 557 pixels per inch. Both numbers are extremely high, leaving individual pixels impossible to discern with a naked eye, and we are quite sure you'd be hard pressed to call one screen sharper than the other. Now, the LG G3 employs IPS LCD technology to for its screen, whereas Samsung, naturally, has a Super AMOLED panel. However, the latter does not mean punchy, inaccurate colors as it has in the past – Samsung has been working on taming the AMOLED image reproduction for the past year, and the S6 edge makes use of the latest advancements, bringing a more natural picture. The LG G3 is powered by Qualcomm's Snapdragon 801 SoC, while Samsung went with an entirely homemade SoC for the Galaxy S6 edge, housing a 64-bit octa-core CPU built on a 14 nm process, which should mean faster performance and more energy efficiency. Galaxy S6 edge also has a new type of internal memory – a new tech, based on the UFS 2.0 standard, brings read speeds up to 2.7 times faster than the currently used NAND flash. Additionally, the S6 sports 3GB of super-fast LPDDR4 RAM, giving it more multitasking prowess, compared to the G3's 3 GB of DDR3 RAM. When talking feature richness, both the TouchWiz and LG's interface can raise their hands and compete for the first spot. Indeed, Samsung's UI may be often scrutinized for being brim-packed with options and processes, which would result in choppiness and lag, but LG's interface is no walk in the park for Android first-timers as well – it, too, has its own set of options, services, and animations, which are known to cause the interface to stutter at times. Well, with the Galaxy S6 edge, Samsung has slimmed down the TouchWiz, doing away with options it deemed useless, and simplifying the overlay for easy navigation, which should not only make the interface snappier, but more intuitive to use as well. The LG G3 sports a 13 MP, F2.4 sensor with a laser auto-focus assistance, which sports all the features you'd expect on a modern flagship – HDR, 4k video recording, panorama mode, smile detection, and others. The Galaxy S6 edge's 16 MP snapper is a step above, though, with a much wider F1.9 aperture, tracking auto-focus capabilities, and auto real-time HDR for both its snappers. The frontal camera on the G3 is a 2.1 MP one, while the Galaxy S6 edge sports a 5 Mp sensor on its front, also with a wide F1.9 aperture and HDR capabilities, allowing for better low-light selfies and chats. The LG G3 has a huge 3,000 mAh battery, which lasted 6 hours and 14 minutes on our battery life test – not a very impressive result, but understandable, seeing as the G3 was one of the pioneer smartphones that had 4K pixels to keep alight. 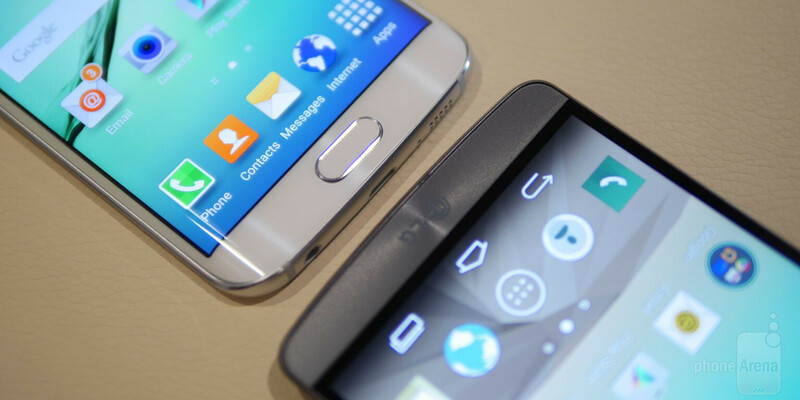 The Galaxy S6 edge has a smaller 2,600 mAh battery, so we wonder, whether its advanced processor and internal memory, and the lighter TouchWiz, will allow it to top the G3's on-time. The S6 edge, however, benefits from a quick charge tech, which should be able to grant the phone enough energy to last it 4 hours with just 10 minutes of charge time. Both smartphones support wireless charging, however, depending on which carrier you get the LG G3 from, it could either only work with WPC or PMA power mats. 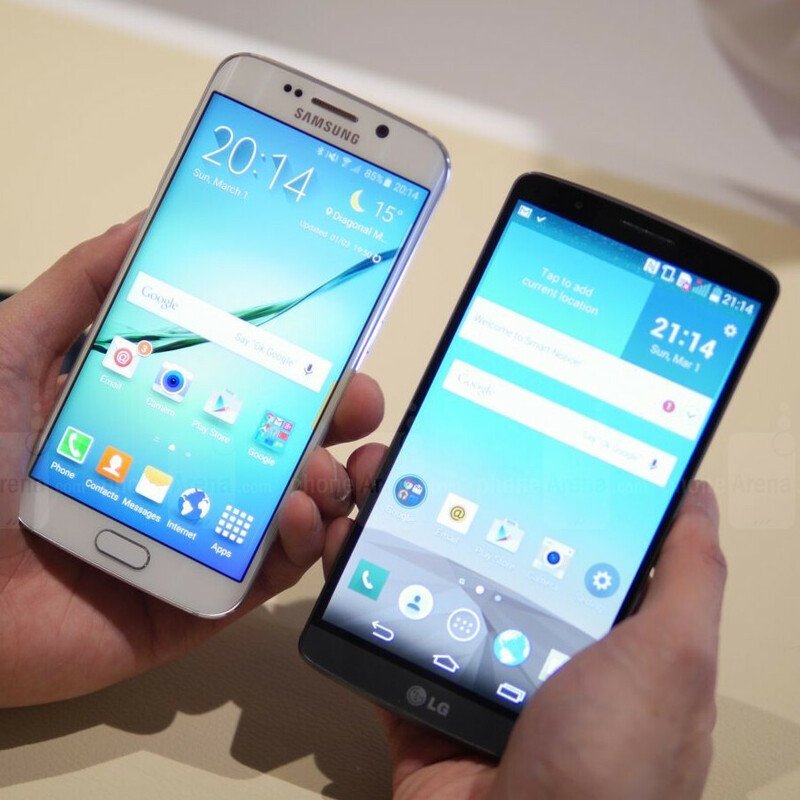 The Galaxy S6 edge, on the other side, is standard-agnostic – it works with both major standards, to fit most situations. Of course, we can't guarantee that certain carriers wouldn't butcher this functionality because they happen to be a member of the competing wireless charging alliance. The Galaxy S6 edge looks and feels incredibly good and our expectations for the handset are high – its bleeding-edge tech looks promising and we can't wait to put it through its paces, so we'd get a better picture of how the handset compares to today's competition. Additionally, we are expecting great things from the upgraded camera, and we can't wait to play some more with the slimmed down TouchWiz, see if it holds up to its promises. 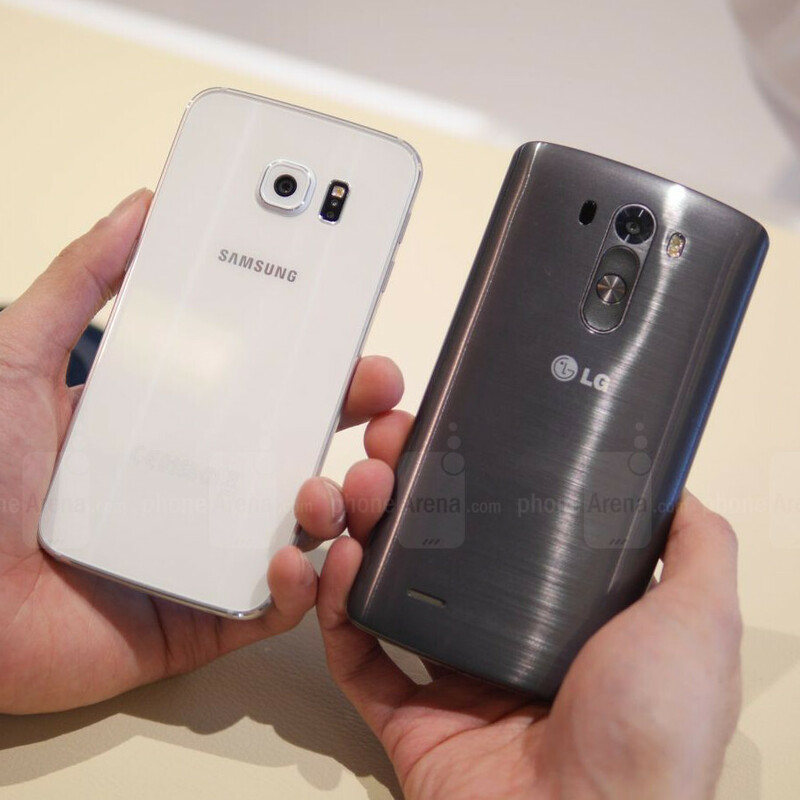 As for the LG G3 – the handset has aged quite well over the past year and still holds up. It may not sport the newest of cutting-edge tech, but we wouldn't be quick to throw it out just yet. Removing the sd slot and interchangeable battery for me is not a good idea for samsung. I'm sure people who uses Samsung knew that this is a beneficial feature. Off topic : Qualcomm announced the SD820. The name of custom core is "Kryo". G3 has Lollipop. G3 also has optical stablisation on its camera. Interested to see the Z4 comparison.